Past King Rat Harry Seltzer BM & Bar was born in Hull on 7 August 1909 and made his first stage appearance at the local Alexandra Theatre in the same city. His first London appearance was at the Bedford Music Hall in Camden Town. Harry was made a Water Rat (Number 408) on 15 November 1942 and was proposed by Teddy Brown and seconded by Ray Leo Murray. By 1945 he was made Trap Guard and the following year elected to the office of Collecting Rat. He also held the unique position of being Prince Rat on three separate occasions in 1961, 1963, and 1968. The following year he was elected to the highest office possible that of King Rat. 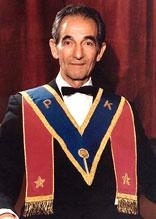 In 1975 he held the office of Treasurer of The Grand Order of Water Rats and in 1982 was made a Trustee of the GOWR. His performing career began appearing as a boy ventriloquist in Will Murray?s Casey?s Court. Will taught Harry to walk and talk and he copied everyone that came into the show. He practiced tap dancing at the digs till 3.o/clock in the morning in his socks so as not wake anyone up! He even tried his hand at juggling. In the end he took up eccentric dancing and worked the variety halls. In 1950 he toured South Africa with a Star Studded London Palladium Variety Show billing himself as Harry ?Alka? Seltzer. The programme went on to say: ?This diminutive lithe comedian with feet as sparkling as his comedy, and a face of incredible mobility, flexible as rubber, into which he always had a cigar. Bubbling over with original ideas he could mime, dance, tell rib cracking stories in an inimitable manner and sing in a catchy style. Harry appeared with all the top names of the day Tommy Trinder, George Formby, Bud Flanagan, Bebe Daniels & Ben Lyon. He toured with Buster Keaton where I am sure they both learned from each other. Harry passed away on 21 September 2004. Rest in peace Harry in the knowledge that you were a unique personality within this Grand Old Order of ours. You always had a smile and a twinkle in your eye. We will all miss you greatly.